This screen is part of a multi-step process. This screen, in particular, lets you add user emails by clicking on the "Add email" button. Clicking "Add email" appends a new textbox to the list. Once you've added all necessary emails, you can proceed to the next step. If a user needs to delete an email, they can just clear the textbox and still be able to proceed to the next step. Only at least one email is required. My question is - does this explicitly need a delete button should a user need to delete an email? Or is being able to clear a textfield a good/intuitive enough solution? Make it obvious what the user can do, and save them work. Rather than make users do several mouse and keyboard actions (if they don't tab into the input field), by having a Remove icon (or even small text) adjacent to the field in question. It also signals that they can remove it. This was not part of your question, but having two similar buttons [add email] and [Next >] seem to compete with each other. 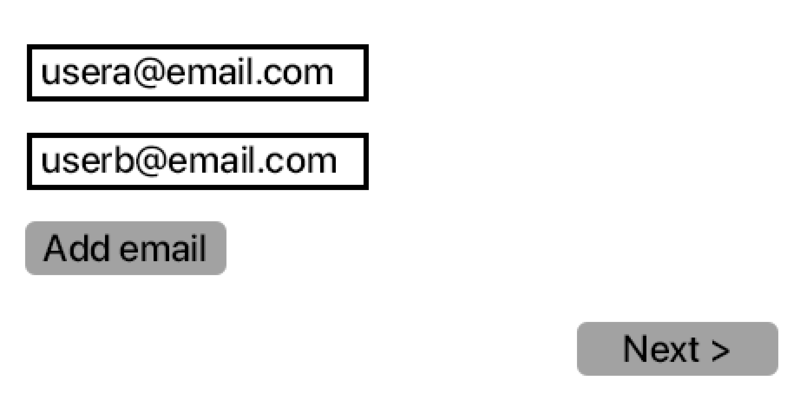 You could turn the Email into a + Email link, and still keep the idea that it's an interactive element, while keeping the primary action button reserved. its just good practice to give the user the option to delete it. just a simple trash can icon or a X would just take the guess work out of it. If the user just deletes the email do they know it would not add a blank email, what happens to the old email will this validate? A simple delete button would remove those questions. Not the answer you're looking for? Browse other questions tagged website-design forms gui-design ux-field wizard or ask your own question. Is it intuitive for a “yes” or “no” button to proceed to the next step automatically in a wizard? What's an intuitive workflow for a registering user to simultaneously sign-up his colleagues? How to signal the user must add a minimum number of images to continue?